For the mooring of our buoys we have selected the long Link chains - pitch 5D - quality SL2 and accessories in 6 different diameters. MOORING There are 17 products. 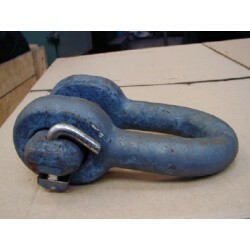 Mooring chain recommended for FLC1200 buoy. Quality SL2 mooring chain. Black varnished. Inside width fit in shackles without special end links. Nominal diameter (ND): 16 mm, Pitch (B): 80 mm, Width (C): 24 mm, Weight: 4.6 kg per meter. 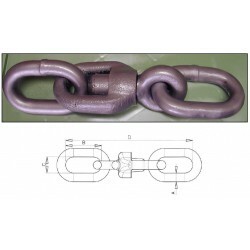 Mooring chain recommended for FLC1200 and FLC1500 buoy. Quality SL2 mooring chain. Black varnished. Inside width fit in shackles without special end links. Nominal diameter (ND): 20 mm, Pitch (B): 100 mm, Width (C): 30 mm, Weight: 7.5 kg per meter. Mooring chain recommended for FLC1200 and FLC1500 buoy. Quality SL2 mooring chain. Black varnished. Inside width fit in shackles without special end links. Nominal diameter (ND): 25 mm, Pitch (B): 125 mm, Width (C): 38 mm, Weight: 11.6 kg per meter. 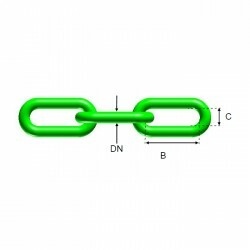 Mooring chain recommended for FLC1500, FLC1800 and FLC2200 buoy. Quality SL2 mooring chain. Black varnished. Inside width fit in shackles without special end links. Nominal diameter (ND): 30 mm, Pitch (B): 150 mm, Width (C): 45 mm, Weight: 16.2 kg per meter.